Throughout this week CEG will be showcasing the artists that are being exhibited at the AIPAD Photography Show New York, April 4-7, 2013. CEG is featuring the work of Keliy Anderson-Staley, Daniel Beltrá, John Cyr, Elizabeth Ernst, Frieke Janssens, Lori Nix and Gregory Scott. 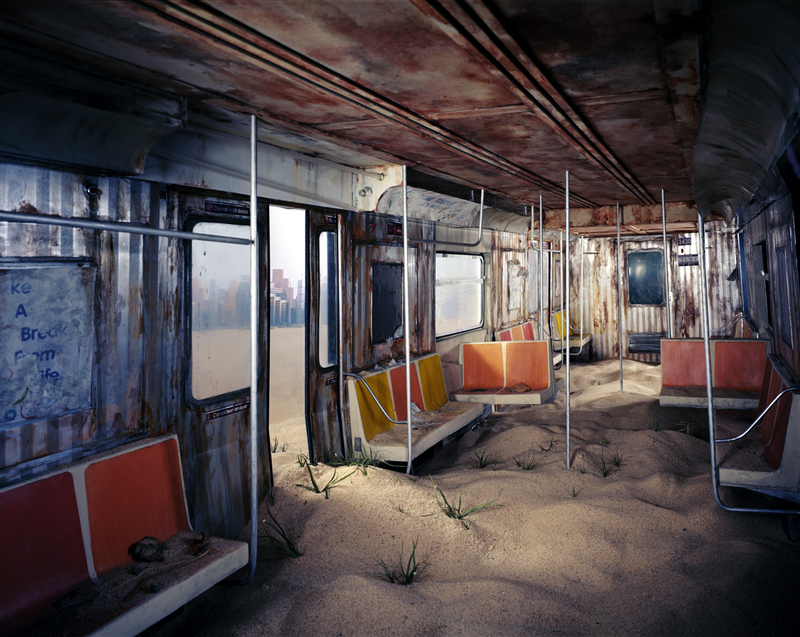 Our fourth featured artist is Lori Nix. When describing her artwork and process, Lori states, “As a ‘non-traditional’ photographer (I construct my subject matter rather than go find it) people find it hard to grasp what exactly it is that I do. And the fact that it is all done in front of the camera, with no digital manipulation, adds its own set of challenges. Building materials, lighting, issues of scale and space all become significant when you are recreating the world on a table top.” Below are a few images of Lori’s construction process for her piece “Subway” followed by the final photograph (which you can view at AIPAD). Subway seats-step 1. Glue together rough cut pieces of pink foam. Use hot-wire then sandpaper to shape. Subway seats -step 2. Cover seats with spackle then more sanding. Repeat 2-3 times as needed to get the desired shape. Subway seats -step 3. Careful taping then painting to get the right look. Subway seats attached to back wall of model. Lori fine tunes the dirty and rusty finish.